I have been making couscous recipes for years – and Couscous Tabbouleh is something I whip up every couple of weeks. It is simple, filling, can taste great, versatile, and keeps well in the fridge. I tend to make a good-sized batch one evening, then bring the rest to work for lunch. A 30 minute investment and about £1.40 worth of ingredients will give me a good base for my Monday-Friday lunches, giving me a great choice of things to add to it over the course of a week. Cold chicken, crumbled feta cheese, olives and artichoke hearts etc all work really well. I am so bored of what is locally available – I’d much rather bring in my own. get a large mixing bowl, and empty the bag of couscous into it. Add the zest of lemon, season well (I am very liberal when black pepper is concerned) and mix thoroughly. Drizzle over 1 tbsp of olive oil and half the lemon juice, and mix together. Make 600ml of chicken or vegetable stock ( 1½ cubes is normally sufficient). Mix well, and pour over the couscous. Using a large fork, mix everything together as thoroughly as you can. Cover with a tea towel and place a dinner plate on top. 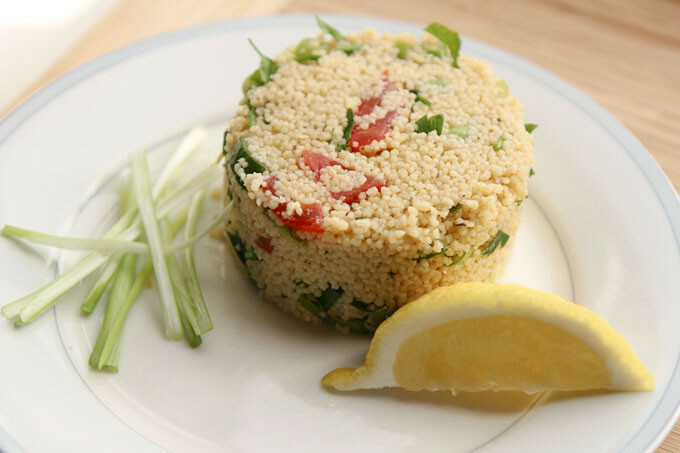 After 5 minutes, uncover, and separate the couscous grains using a fork. Don't worry, it may seem to be quite arduous at first but with a little persistence, it will crumble apart into individual grains. It is a bit like raking through wet sand at first. Ensure that the grains are well separated (it is quite easy to leave behind a significant clump of couscous at the bottom of a large bowl) and, uncovered, allow to cool. Finely dice the tomatoes, cucumber, and thinly slice the spring onions and mix well with the couscous. Thinly shred the parsley and mind and add to the bowl. Add the remaining olive oil and lemon juice, mix well, and season to taste. Do not be afraid to tweak this to your liking. Want it zingier- add some more lemon juice. Store what you do not need in a large Tupperware container. Add a wedge of lemon if storing for 3-4 days to maintain a fresh flavor. As an alternative to lemon, mint, and parsley, why not give coriander, chilli, lime zest and lime juice a go? I think this works really well. I don’t cook the grain with stock. I prepare a kind of lemoned marinade and mix with couscous semolina but I have to wait for several hours before it’s cooked thanks to lemon juice! Spring onion are perfect to eat with!